← Elon Musk is Rocket Man. So excited to announce that the pets are finally here! 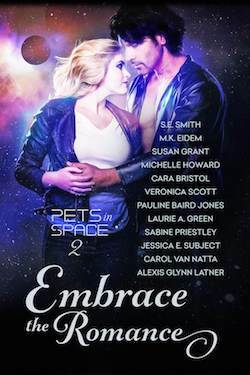 Embrace the Romance: Pets in Space 2, featuring twelve of today’s leading Science Fiction Romance authors, brings you a dozen original stories written just for you! Join in the fun, from the Dragon Lords of Valdier to a trip aboard award-winning author, Veronica Scott’s Nebula Zephyr to journeying back to Luda where Grim is King, for stories that will take you out of this world! Join New York Times, USA TODAY, and Award-winning authors S.E. Smith, M.K. Eidem, Susan Grant, Michelle Howard, Cara Bristol, Veronica Scott, Pauline Baird Jones, Laurie A. Green, Sabine Priestley, Jessica E. Subject, Carol Van Natta, and Alexis Glynn Latner as they share stories and help out Hero-Dogs.org, a charity that supports our veterans! The best part of being part of this anthology is that 10% of all preorders and the first month’s profits go to Hero-Dogs.org. Hero Dogs raises and trains service dogs and places them free of charge with US Veterans to improve quality of life and restore independence. 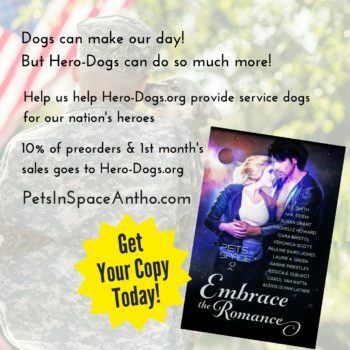 This entry was posted in Books Blog and tagged #sfr, Alien Romance, Books, Hero Dogs, military, Pets in Space, Romance, Sabine Priestley, Science Fiction Romance, service dogs, veterans. Bookmark the permalink.